It would have been easy to stay had my job contract been extended. Probably just as well it wasn’t. The work I was doing on paper had fizzled-out a long time ago. Whatever my employer in Dar-es-Salaam thought teacher trainers like myself were doing ‘up-country’ I have no idea. I had been posted to Mwanza to work in a Government Teacher Training College, but I soon came to the conclusion that no-one really did any work there. No wonder the country’s education system was in such a dire state. Tutors in the college rarely went to teach a class and once the novelty of my presence soon wore off I reached the conclusion that most people didn’t really care if I was there or not. It was just as well I liked living in Tanzania. From an outside perspective I was just a small fish in a foreign-funded aid project, employed as part of a poorly coordinated effort to improve the English language education system in a country where Kiswahili is very much the national language. It was always going to be a challenge. At the end of a two-year contract it was a more optimistic soul than me who said they had made a real impact or improvement in the education system. The Ministry of Education had happily signed-up to the project when the donor was ready to release funds. Well why wouldn’t they have done? African governments love outside assistance. British tax-payers money in this case. I could continue for some while yet about the reasons for Tanzania’s failing education system and the enlightening insights gained from working on an aid project in Africa, but I shall return to the tears at the front gate. They didn’t last long. Well had no real reason to cry. Yes I was sad to be leaving, but also happy to be hitting the road again. I always suspected when I finished my contract that I would just pedal off. It seemed like the simplest thing to do. One push on the pedals and you’re free-wheeling away – assuming you’re going downhill to begin with, which I was. The road through and out of town was of course familiar. 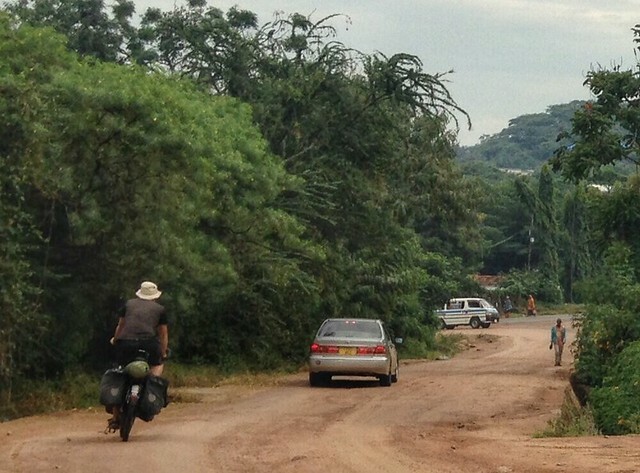 There are only two principal routes into and out of Mwanza. 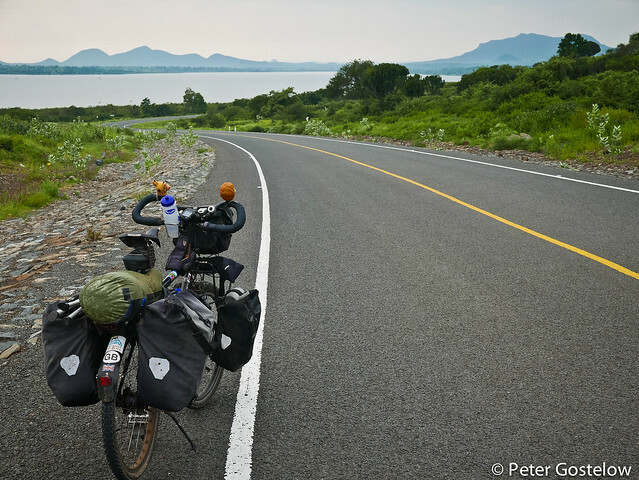 One leads south towards Shinyanga and the rest of Tanzania (the same road I cycled on a daily basis to college at one time) and the other east, rounding Lake Victoria’s Speke Gulf before it turns north in the direction of Kenya. It was the latter that I and two friends pedalled out on. The weather couldn’t have been better really. 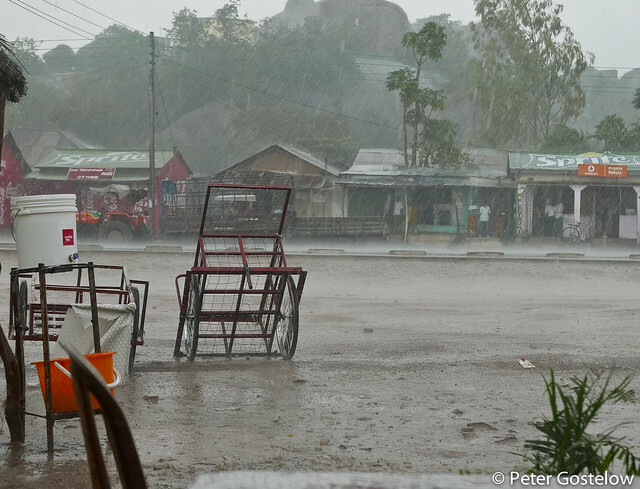 It had just rained and rain is almost always welcome in Africa, particularly in the dry season. The sky was overcast and the air refreshingly cool. I didn’t even apply sunscreen. 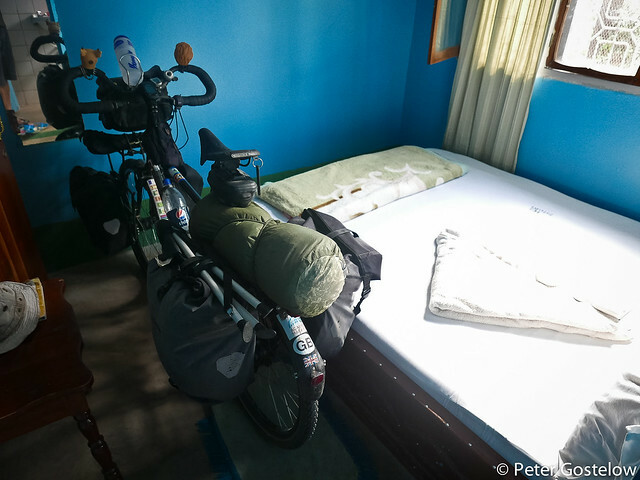 For some years Ethiopia has been on my list of countries to visit, so when I first conceived the idea of a cycle tour at the end of my contract, this seemed like the most obvious place to pedal off towards. That remains the plan. But then I started reading about Somaliland (not Somalia) and how great Oman was to tour in winter. Mwanza-Muscat had a nice sounding ring to it, so there we are. Unlike the last several tours I have made in the past few years I don’t have a specific time-frame for this journey. It’s great to have that luxury again. The freedom to wake up somewhere and think yes, I will stay here another day, or look at a map and decide to take some circuitous and remote dirt road rather than rushing along a main route. That’s a great feeling. 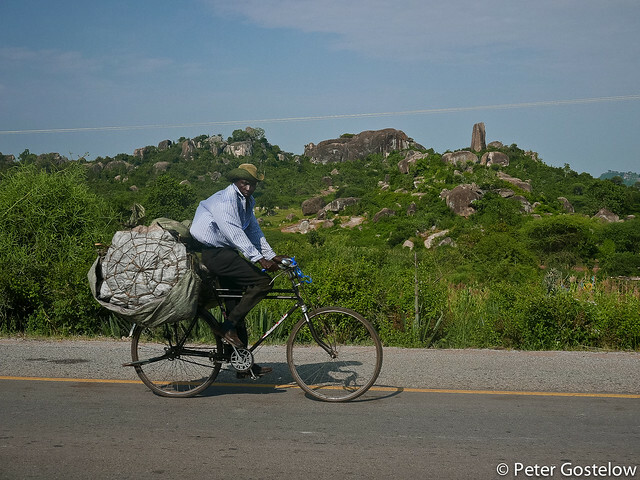 So I rolled out of Mwanza at a rather leisurely pace on that Sunday morning, my front panniers about 5kg heavier than they needed to be owing to various foodstuffs that weren’t a necessity to carry (1kg of dates, 2 large mangoes, 1 kg of popcorn, 500g of oats, 500ml of cooking oil, 500g of Tanzanian coffee and a can of redbull that had been left over at a small leaving party I’d thrown a few nights previously). 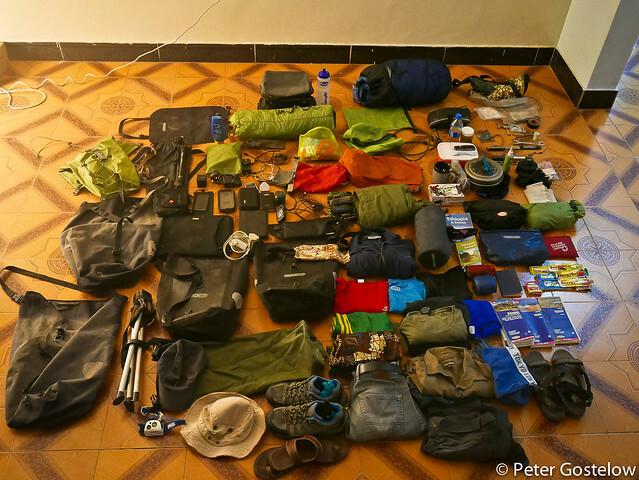 I’d laid all the gear out the previous night on the floor of my sitting room, then put it into panniers and balanced them out the following morning. Well that didn’t didn’t take long. I’ve done it hundreds of times. Tool bag and spare front tyre below foodstuffs in one front pannier, cooking pots, stove, tupperware container (holding salt, pepper, chilli and curry powder, spork, lighter) and more foodstuff in the other front pannier. The rest finds a home in the rear panniers with the camping bag bungeed onto the top of the rack. 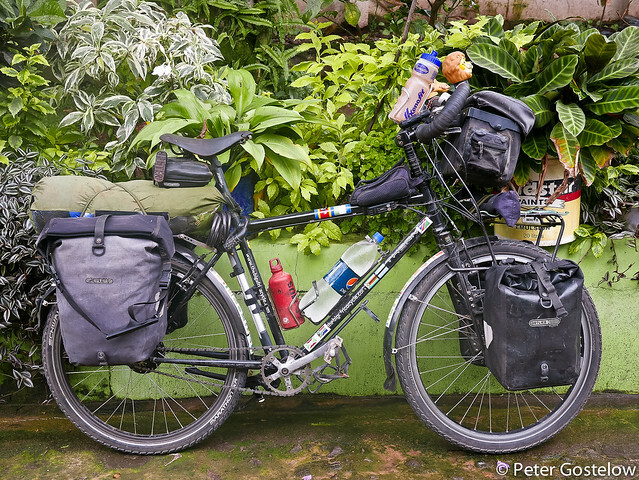 Oh, and my handlebar bag that contains camera, passport, money and map. All in all about 34kg on a bike weighing 20kg. That’s not a light load, but if I wanted to lose several plus kgs, aside from the food, there are plenty of ways. Those jeans with the leather belt perhaps. I never used to tour with a pair of jeans, but then there are occasions, not camping in the bush, where it’s nice to get out of cycling gear. I only got as far as the small town of Magu on that first day, just 65km. Rain fell heavily for a few hours so I took an early lunch stop with one of the friends who would later turn back, then waited for it to pass. 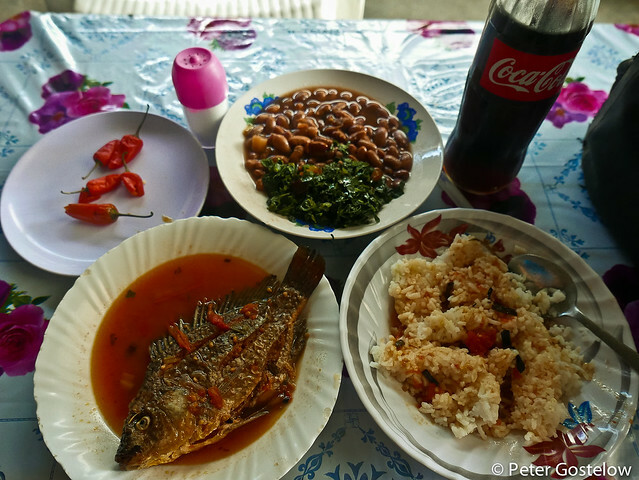 Roadside eateries are common and easy to find in Tanzania. A bucket of water, like the one pictured above, acts as a hand-basin to wash your hands before and after a meal, which is very much the custom. How clean the water is inside the bucket who knows, but rather than look for a sign-post advertising somewhere to eat, a bucket like this is a better indication that food is nearby. In more simple establishments it will be cooked outside over a few charcoal braziers. 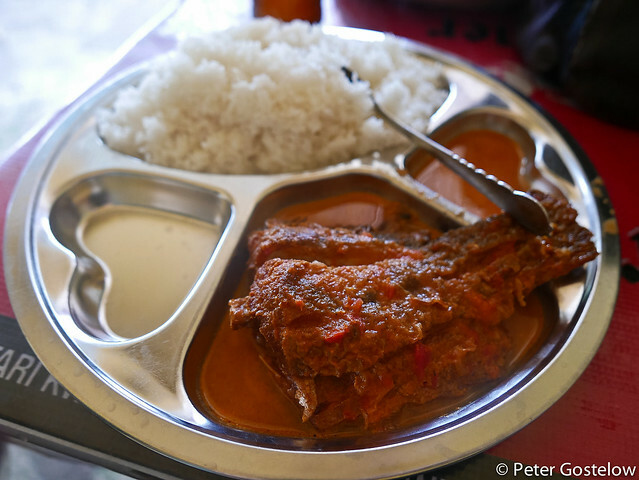 Food on the road in much of Sub-Saharan Africa is a simple affair. 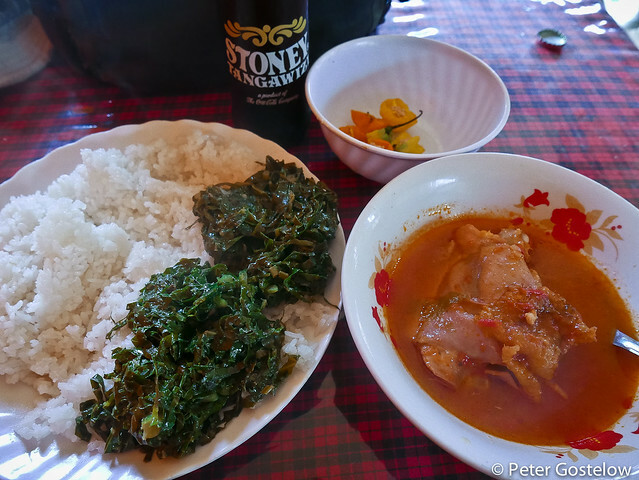 Rice, beans, Ugali (cassava or maize stodge – see pics) meat (one of or a choice of chicken, beef, goat, fish) and some green-leafed veg pretty much sums up the majority of lunches. One can’t really go wrong with beans, which has the habit of producing some serious post-lunch sound effects from the area of my saddle. I always tell anyone who cycles with me that the most dangerous place to be on the road is right behind me. 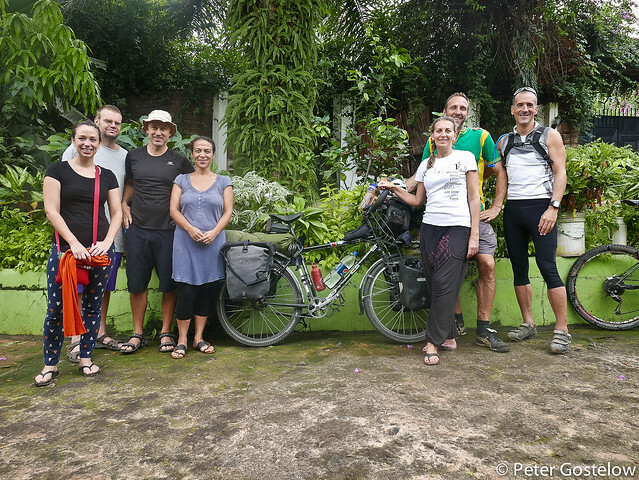 I knew the road as far as Bunda, having cycled it before in the opposite direction. Lake Victoria is never very far away, but mostly out of sight. 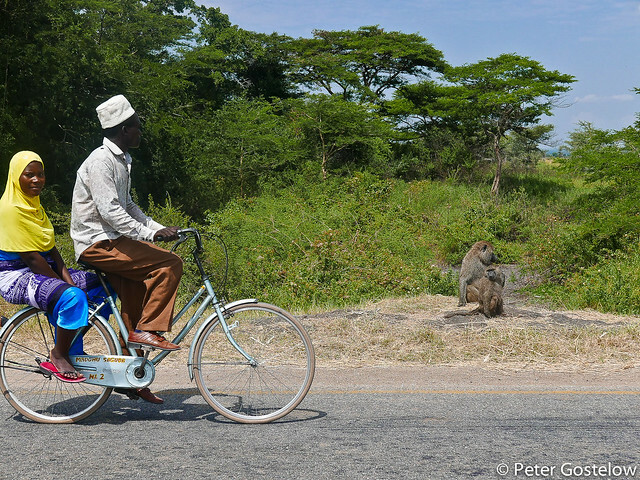 It’s not a particularly scenic road – most flat ones aren’t, but following the rains the landscape is green and for a brief stretch the road forms the western boundary of the Serengeti National Park. Most large animals are probably sensible enough to stay further inside the park, but zebra, wildebeest, baboons and monkeys don’t seem particularly bothered by passing traffic. In Bunda I missed the opportunity to sleep in the JoyDick Hotel, having already checked-in to one of the many other affordable lodgings that were less amusingly named. 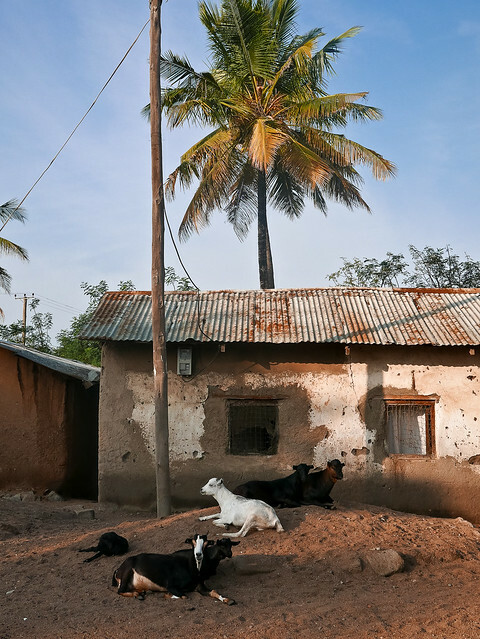 Like food, accommodation in Tanzania is easy to find and most places have the added bonus of composing of a single storey. 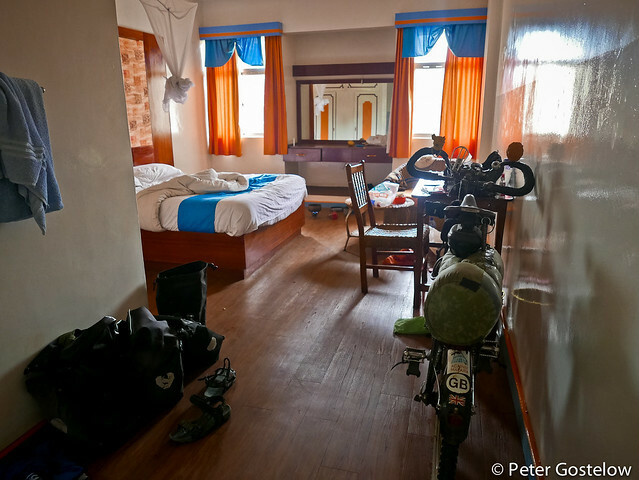 This means it’s easy to wheel the bike into the room rather than having to lug it up some stairs. 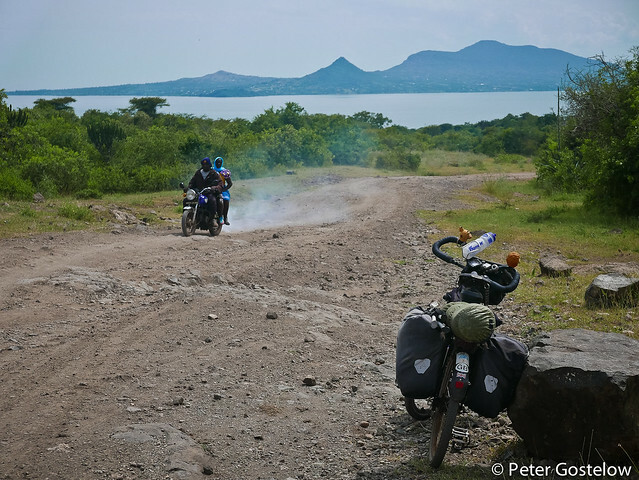 North of Bunda I veered off on a dirt track towards the sleepy lakeside town of Musoma. At one time in the early 20th Century this was an important German garrison town, when Tanzania was part of Deutsch Ostafrika. Now its dusty grid-lined streets and faded shop-fronts display neglect. 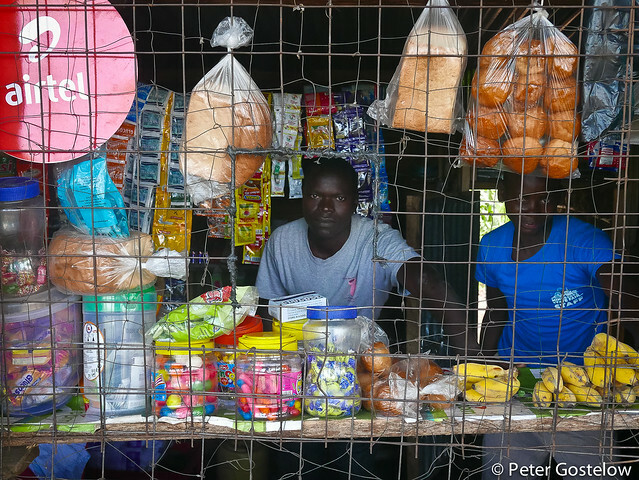 In Africa it’s much easier to build new again rather than maintain something that’s old. 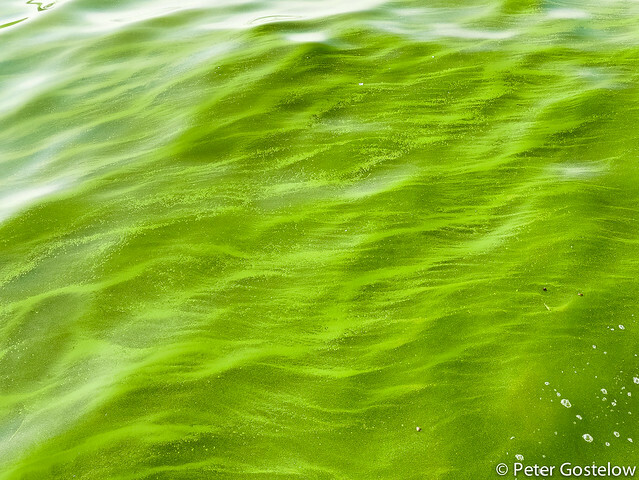 The lake at Musoma was a wonderful bright shade of green. Highly uninviting to go for a swim in. In actual fact during the 2 years I lived in Mwanza I only once went for a swim in the lake, and that was off a beach on the island of Ukerewe. 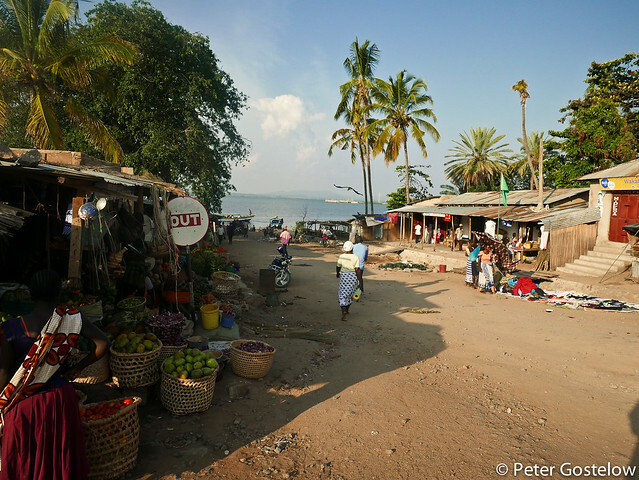 Unlike Lake Malawi and Lake Tanganyika, where the water is blue, clear and clean, much of Lake Victoria is a murky mess. There are various reasons for this. One is the introduction of the infamous ‘Nile Perch’ by British Colonial officials in the 1950’s. While Lake Malawi and Tanganyika have hundreds of small cichlid fish that eat up bacteria and detritus, the Nile Perch, which grows to monster sizes, eats all these fish. 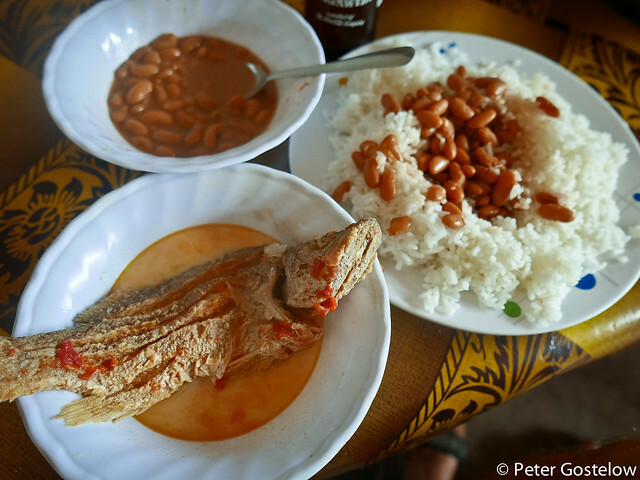 Many businessmen and government officials see the fish as an economic boost (the fish is exported around the world), but it’s also the story of an environmental disaster. Aside from the uninviting colour of the lake for a swim, there is bilharzia to worry about, and the usual stories involving crocodiles and hippos. Back on tarmac I continued towards the Kenyan border, the climb in altitude a reminder that I really didn’t need to be carrying 1kg of popcorn. Rocky outcrops flanked the roadside and the scenery improved. At one point in the mid-day heat I spotted a small solid object slowly moving across the road in front of me. As I approached and got off the bike it stopped then disappeared into its shell. It wasn’t going to move until I did, but I was glad it had safely made it across the road. 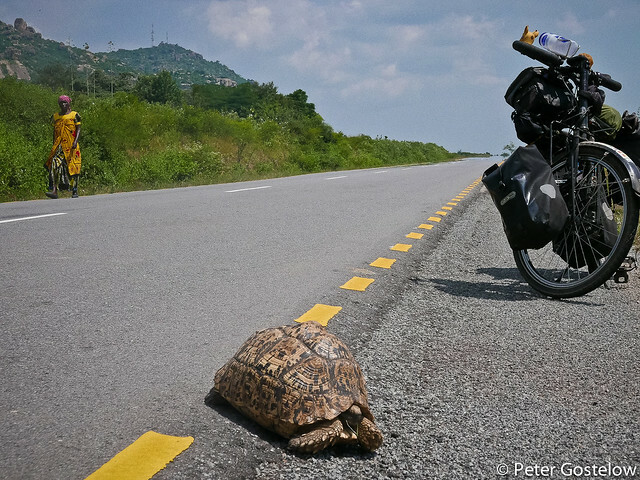 It’s not a common sight to see tortoises on the road in Africa. At least not in my experience. Dead snakes or dogs are much more familiar. At the Kenyan border I very nearly didn’t pay my $50 for a 90-day visa. Very nearly in the sense that I had been given my passport back and told to enjoy my stay in Kenya without having paid any money. ‘Is there anything else?’ I asked the pretty immigration clerk before preparing to walk out of the clean and newly built hall. ‘No that’s it’, came the slightly unsure reply. Well I could have reminded her there and then, but didn’t. I was 10 seconds from wheeling the bike through the barrier nearby and disappearing off before a security guard called me back. 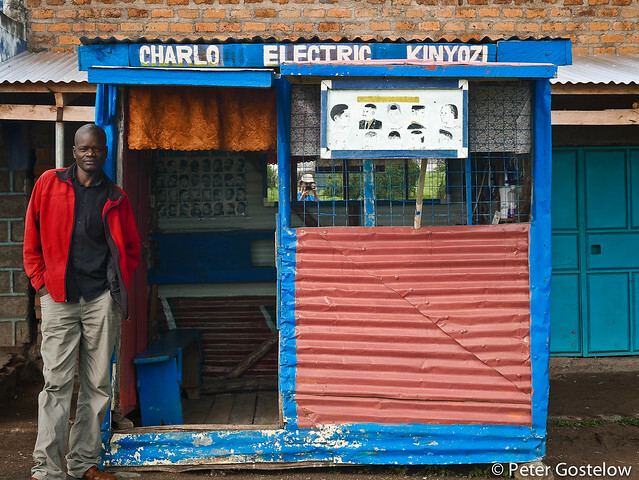 In Kenya’s first town, Migori, the bank wouldn’t change my Tanzanian shillings. I could have done this at the border nearby, but my neighbours in Mwanza had been scammed there recently in an identical fashion to one I recall at another African border. ‘No-one here wants that money’, said the corpulent bank manager who was more interested in knowing the value of my bicycle. ‘You can find a forex bureau in Kisumu’. So I changed some British Pounds and went in search of a Guest House and cold beer. 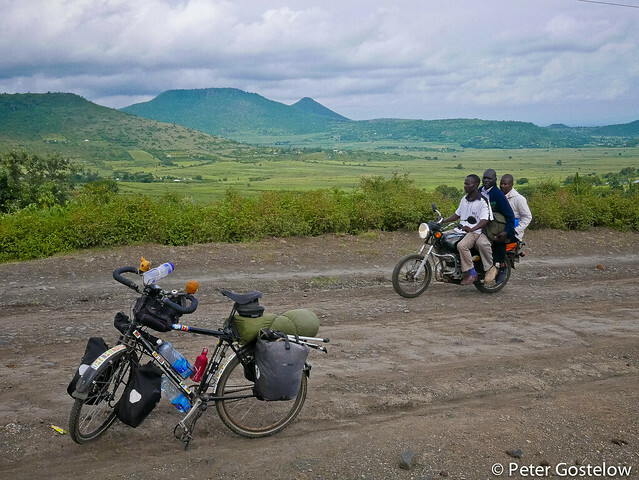 Kisumu was where I was headed to, but I chose to ride back towards the lake from Migori. 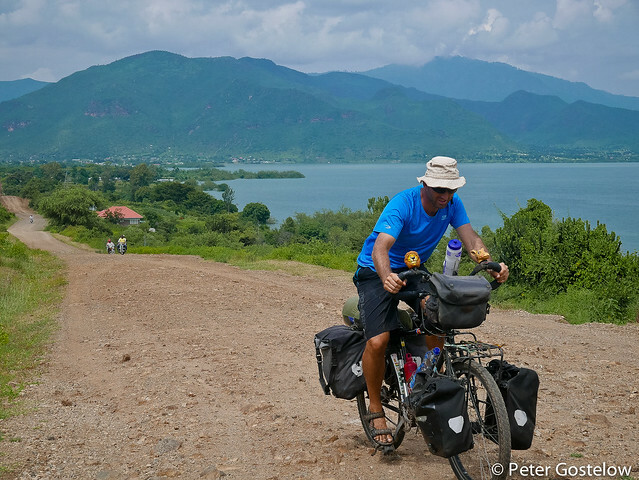 It was a scenic dirt track in stretches – green hillsides and views of the lake in places. Not much four-wheeled traffic, but often three or four people on a moto-taxi. 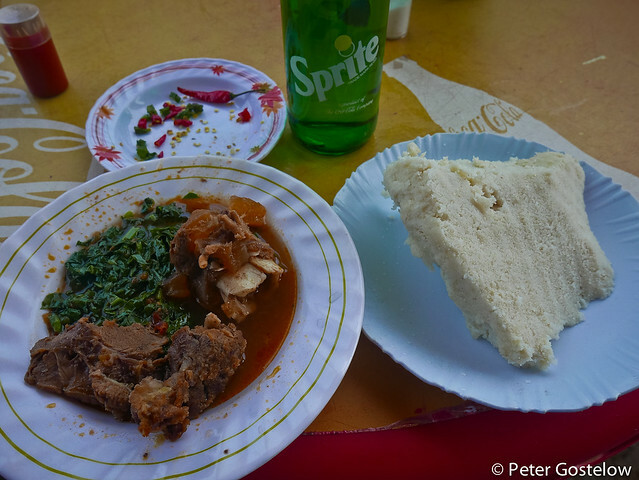 Interacting with Kenyans in shops and roadside eateries is a lot easier than with many Tanzanians. Firstly people speak a lot more English, but more importantly there is a greater level of confidence about them. In Tanzania I could converse in simple Kiswahili, but there was often a reserved nature about people. Many would be surprised a mzungu could speak Kiswahili, so it was less common that they would initiate a conversation, while children would call ‘mzungu’ out from the roadside, but often runaway if I stopped or attempted to take a picture. The context here however is more or less often the same. Stories of poverty, the need for school fees etc etc. In one village where I wanted to confirm I was heading in the right direction an elderly man called me over. He was manning a small petrol pump. ‘What can you do for me’? he asked while I looked down at my paper map. I laughed, made sure I was on the right road, then pedalled off. It was a question I heard more than a few times. Well that’s nothing new. 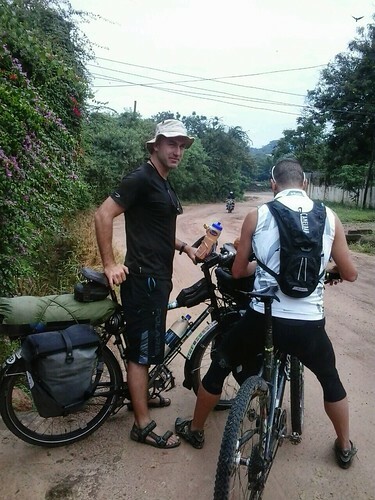 Cycle tour through Africa and rarely will there be a day when something isn’t asked of you by someone. I learnt a long time ago that it’s good practice not to stop when someone is waving you down or pretending they need water from your bottles when there is a water source nearby. Rather than just wanting a chat, which may well be the case, there will often be some other agenda that involves me providing financial help. 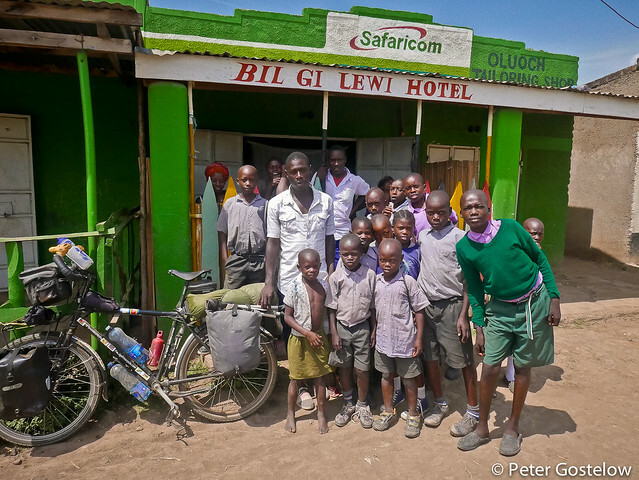 Most Kenyans in this part of the country aren’t hesitant to tell you how much of a problem AIDS is. 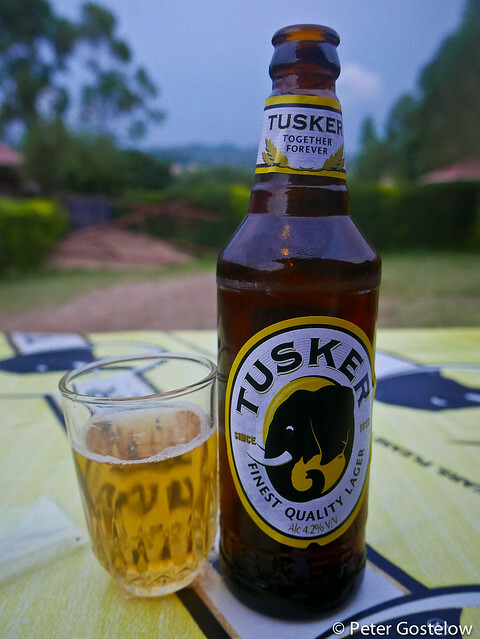 Western Kenya has some of the highest rates in Africa. When I asked people for the reasons they simply said it was due to poverty. It was usually me who suggested that the rates would be lower if people used condoms. Condoms are free here, so there is no excuse there. 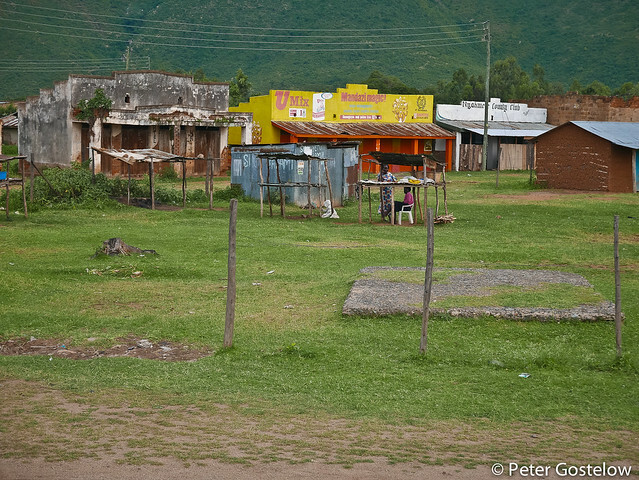 Another noticeable feature of rural Kenya is how many abandoned and boarded-up buildings there are at the roadside. Makeshift corrugated or wooden shacks are favoured over concrete structures – the kind of places that could be constructed in half a day with minimal cost. I’m not sure why I imagined Kenya to be more developed in this respect. Rural poverty is very evident. When I rejoined tarmac from the village of Mbita it was on that super-smooth texture that signals a sign of Chinese influence in recent years. 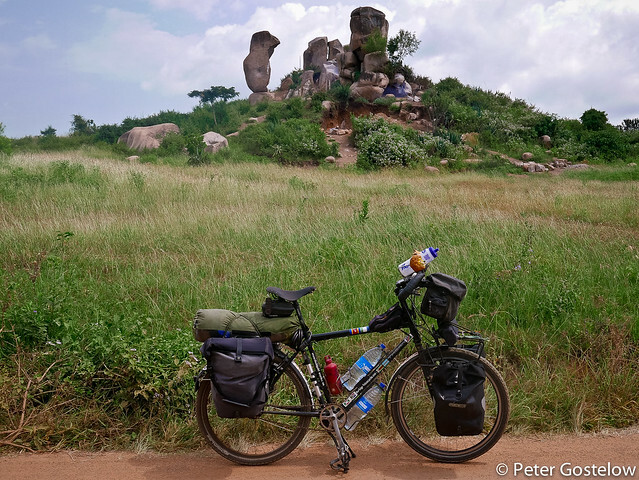 I had cycled just under 600km from Mwanza and had less than 100km to reach Kisumu. Well that’s where I am now. Enjoying fast Internet and several days of rest in a room larger than some of the cell-like spaces I might spend a night. I haven’t actually camped yet. Possibly on the next stretch. From here I’m heading off in a totally different direction to Ethiopia. More about that in the next post. A map of the route I just took and an elevation chart can be viewed at the bottom of the Maps page. Awesome writing. Your photos are stunning! Not sure if they’re better than before or if I just forgot how good you are at photography. I look forward to following you again! Great to know you’re back on the road, I never thought the whole ‘being in one place’ thing suited you! Have fun and look forward to reading more. and the photos…………terrific as usual. Keep me posted. I love the way you write. 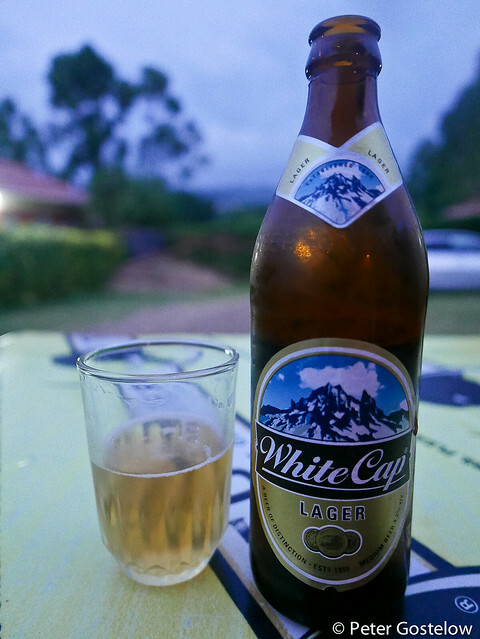 White Cap, Tusker……pictures of bicycles…..rural decay…..it’s all there. 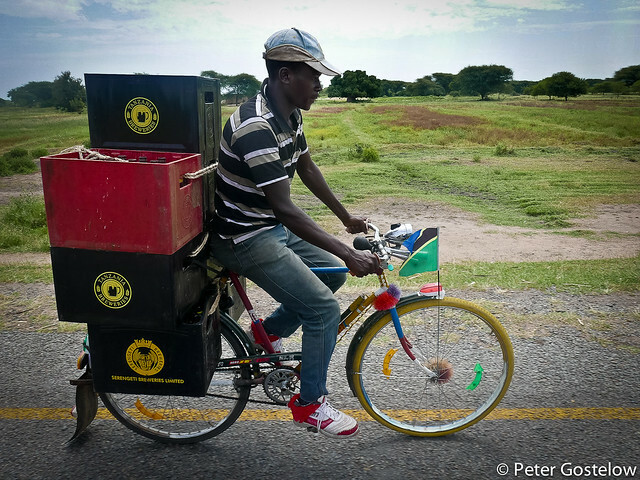 great piece – really enjoyed I as I lived in Musoma when I was lttle! 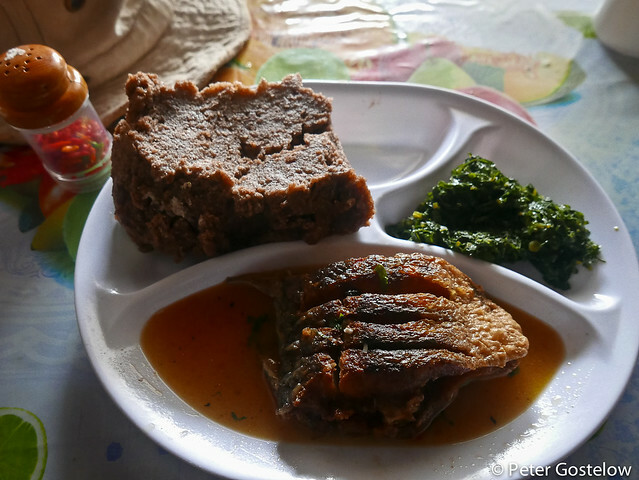 Found a place in Pangani called ngalawa for sale – maybe you know it? Hi Ian, Funny to think you grew up in Musoma. And I suspect have never been back? I don’t know Ngalawa – it means outrigger in Kiswahili. I had a quick look on the Internet. I spent a night or two in Pangani a few years back. 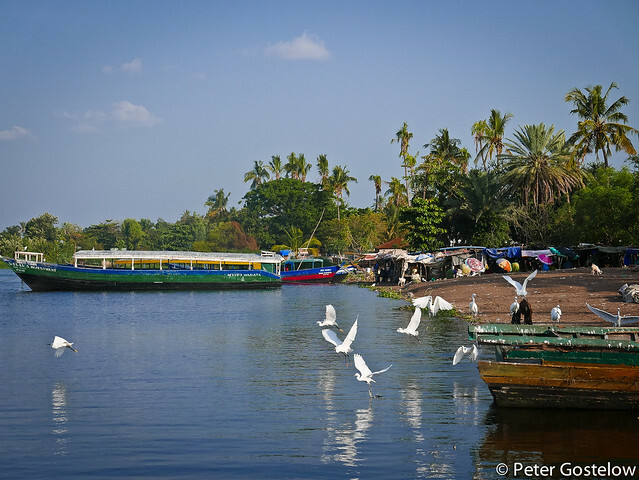 Amazing beach – lovely sleepy backwater of a town. nice journey. beautiful pictures. a little description. excellent job. 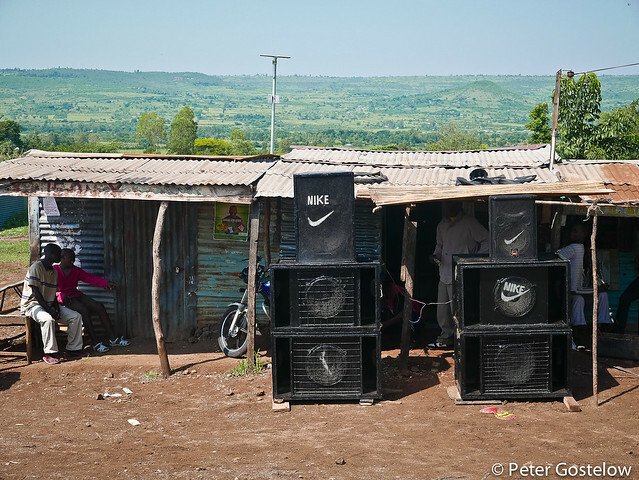 Hi Peter, It is very interesting to read your comments on your job experiences and the differences between Tz and Kenya! Love your photos and your unique commentary. I’m looking forward to following you to Muscat!